Rolex—the name itself conjures an image of a person lapped in luxury, loaded with precious jewels, and being waited on hand and foot. 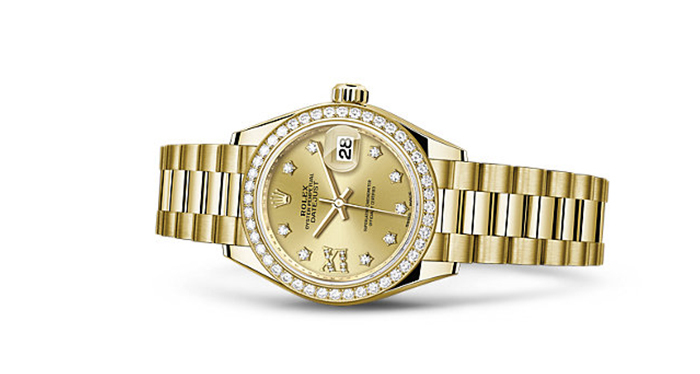 For watch enthusiasts around the world, the ultimate satisfaction would be to add a Rolex to their collection. For many of them, though, this dream may just remain that—a dream. Be that as it may, there’s no harm in looking at pictures of those gorgeous Rolex watches and silently lusting after them. Plus, this list could act as a mood board for you while making any future wristwatch purchases (*whispers* and looking for imitations/fakes). So what are you waiting for? 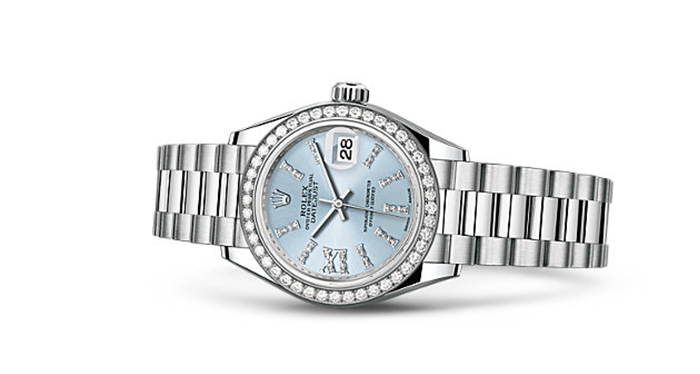 Check out the top 20 watches that Rolex has to offer for women right now! I think…I’m in love. Made entirely out of 18 karat white gold, the strap accented with parallel lines of diamonds, and the dial paved with 455 (!) 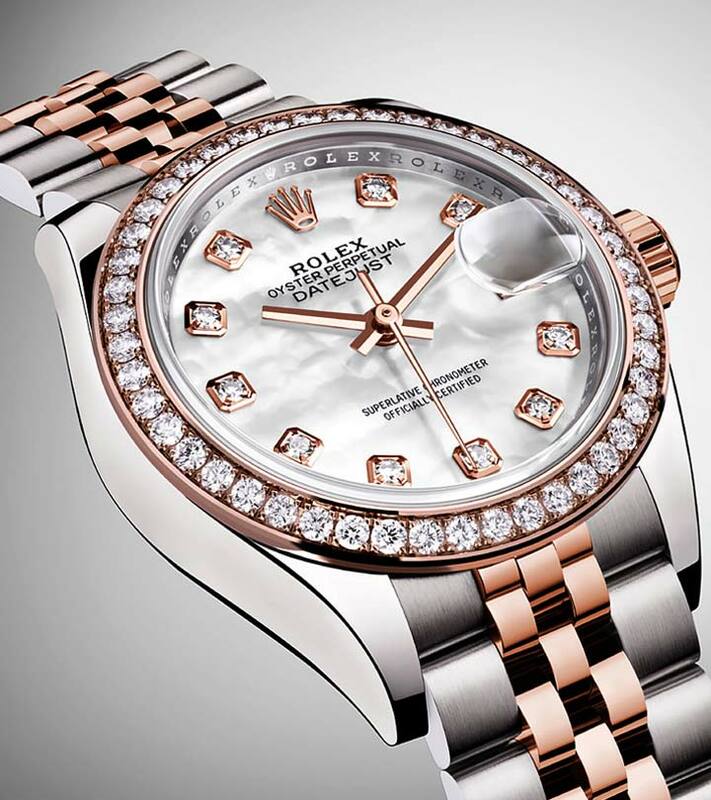 diamonds, Rolex outdid their own level of craftsmanship with this piece. And, it does not stop there. 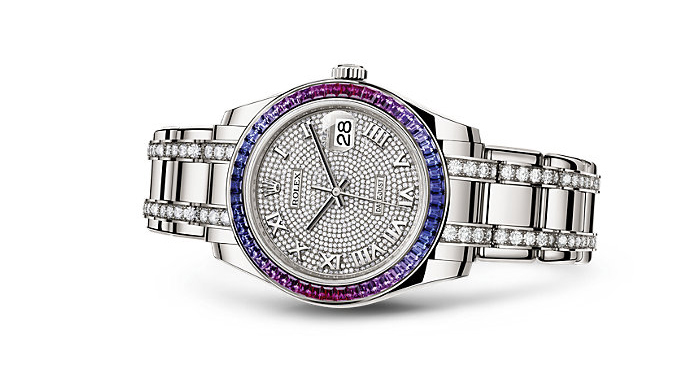 The pièce de résistance of this watch is the bezel set with 48 sapphires that form a beautiful gradient from blue to fuchsia pink and elevate this masterpiece from simply remarkable to absolutely extraordinary. In recent years, rose gold has firmly established itself in the jewelry market and as the go-to elegant metal for women around the world. 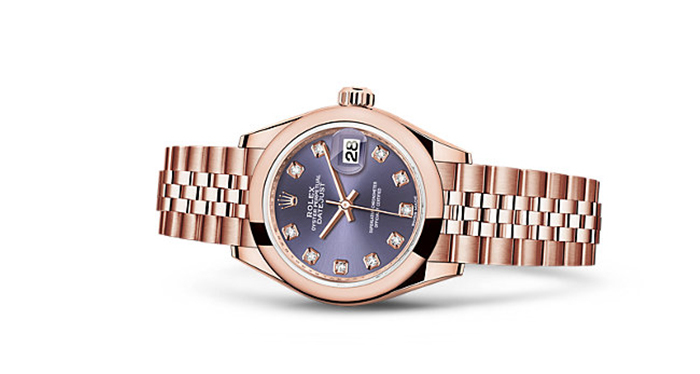 Made with 18 karat Everose gold and accented with diamonds, the Lady-Datejust 28 is a watch for the modern millennial woman. The chocolate dial bezel set with diamonds and the star shaped hour markers add a hint of unconventionality to this otherwise classic piece. When it comes to jewelry for a professional setting, rose gold is your safest bet. With its Everose gold body and simple white dial, the Pearlmaster 34 exudes an air of quiet dignity. A hint of sparkle has been added to this elegant piece by 12 diamonds around the bezel that perfectly align with each of the 12 Roman numeral hour markers. 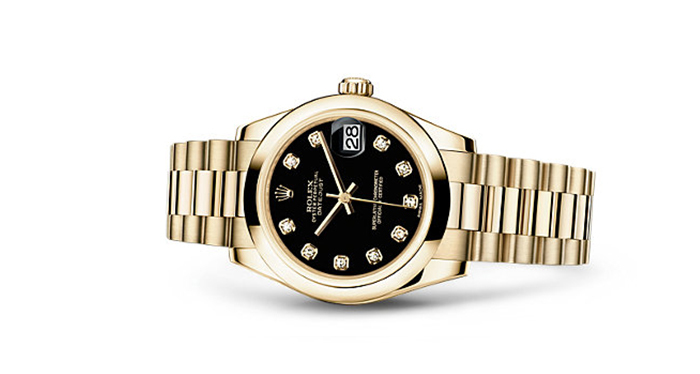 When it comes to premium watch-making, Rolex is not only a stalwart but also a pioneer. And its unique combination of white gold and steel (trademarked as Rolesor) that has been used to make this particular timepiece is a testament to just that. While the Jubilee five-link bracelet and fluted bezel add a hint of masculinity to this piece, the 12 diamond encrusted hour markers set against a midnight black dial are reminiscent of a star-studded night sky. When you think of jewelry that is fit for royalty, this is probably the kind of timepiece that comes to your mind. With the whole body made of 18 karat solid gold and the bezel encrusted to the hilt with diamonds, this watch is the very definition of outlandish luxury. The smooth champagne colored dial is accented with hour-markers in the shape of stars work together to complete the opulent appeal of this piece. While a few people are satisfied just owning a Rolex, there are others who may want a Rolex that is absolutely one of its kind. With its woven bracelet made out of Rolesor and yellow gold that beautifully complement each other, the Datejust 36 truly makes for a unique timepiece. As 100% natural Mother-of-Pearl is used when handcrafting each dial, each one is remarkably one-of-a-kind. 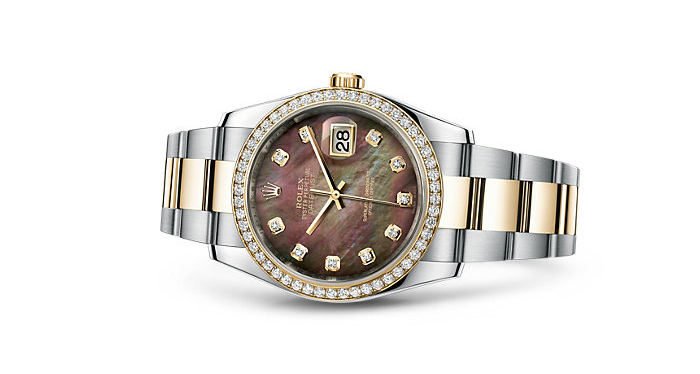 The natural hues of the Mother-of-Pearl are augmented by the square hour markers made out of yellow gold and studded with diamonds. Yes, owning a Rolex timepiece is serious business. But that doesn’t mean that you can’t let your quirky side show through this flamboyant purchase. 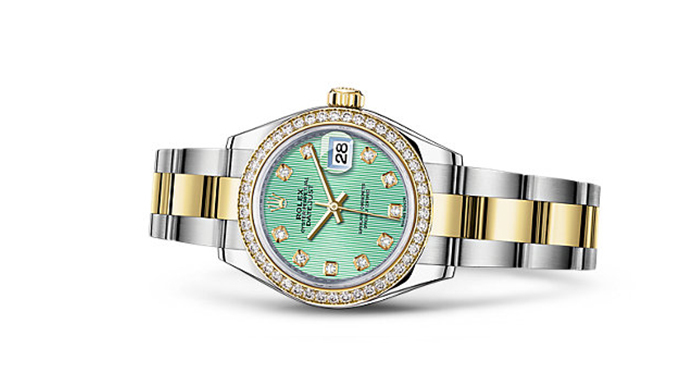 This Datejust 36 piece keeps things simple with its simple Jubilee multi-linked bracelet and bezel set with diamonds. Things get interesting with the bronze dial that is self-embossed with what appears to be a floral motif but is actually the mechanical cogs responsible for the inner workings of a watch. If I had been asked to christen this watch, I would probably name it ‘Golden Opulence’ (Yes, like the most expensive ice cream sundae in the world). The 18 karat solid yellow gold body and the bezel and lugs set with diamonds of this timepiece are a true mark of the indulgence and luxury of its wearer. But what truly sets this watch apart is the champagne dial embossed with the intricate Jubilee pattern that spells out the brand’s name repeatedly. Metal straps aren’t your thing? 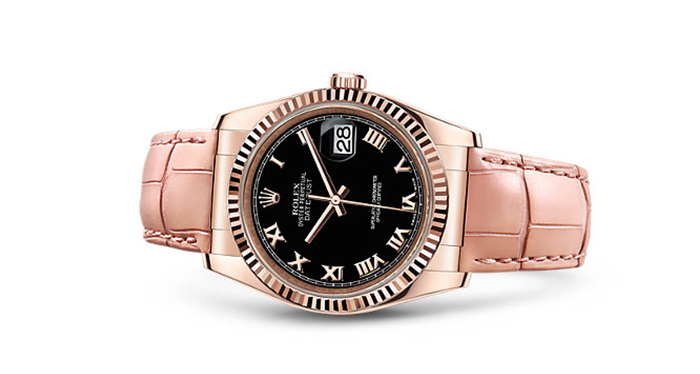 Rolex caters to your preference with this Datejust 36 timepiece with a gorgeous rose gold hued leather strap that is bound to fit snugly around your wrist. The demure beauty of this watch is elevated with a jet black dial set with Roman numeral hour markers and a fluted bezel expertly crafted out of Everose gold. 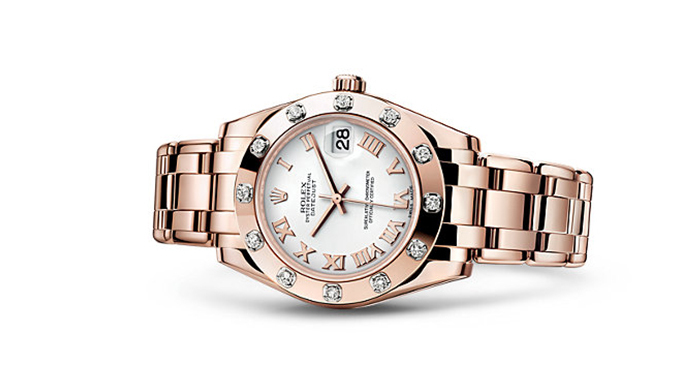 Here’s another timeless rose gold Rolex women’s watch design that is unique in its simplicity. 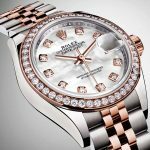 Built from Rolex’s patented formulation of 18 karat pink gold alloy (perfectly christened Everose gold), this timepiece seems like it was made to sit on a princess’ wrist. The lustrous aubergine dial adorned with diamond hour-markers and the domed bezel work together to create a beautiful harmony of simplicity, elegance, and class. Dignity, composure, and confidence. 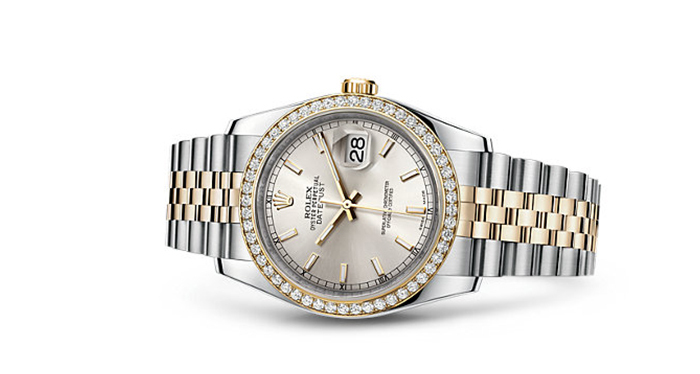 These are the words that come to my mind when I look at this watch from the Datejust 36 line. The design has been kept quite simple with the yellow gold and steel mixed metal strap and the silver dial. This theme of simplicity continues to the silver dial that has simple gold-set linear markers…and is bezel set with diamonds. 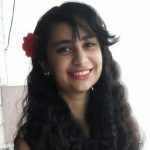 If you would like to take the unique approach to your Rolex purchase or are into unconventional designs, your search ends here. This mixed metal piece has a strap made of alternating yellow gold and steel and a bezel studded to the hilt with diamonds. But a distinctive air is lent to this piece by the mint green and white striped dial that adds a pop of color to the otherwise classy design. If you like to keep things simple and swing towards minimalist designs, this Datejust 31 style will suit you perfectly. There are absolutely no frills and fancies attached to this watch…except for the fact that it is made out of 18 karat solid yellow gold. 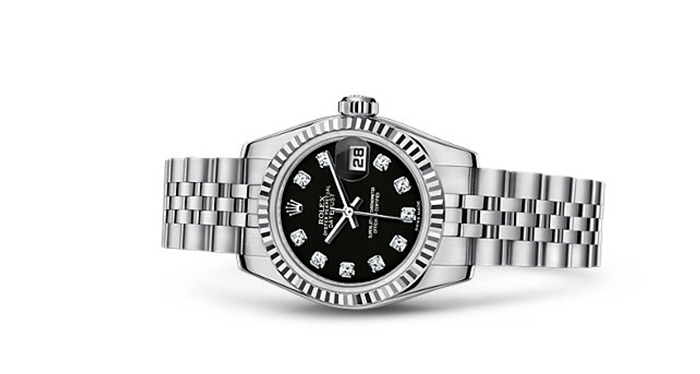 The classy demeanor of this piece has been retained by the jet black dial that is set with 11 diamond hour markers and the patent gold Rolex crown that forms the 12th marker. If you seek to get the most flamboyant Rolex that you can get your hands on, then your search ends here. Though the straps of this Pearlmaster 39 have been kept quite simple with Everose gold, it is the dial that calls for attention. 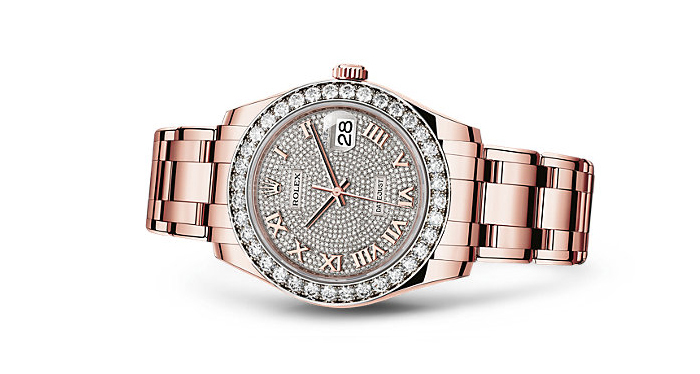 Not only is this dial’s bezel set with diamonds, but the dial itself is paved with an astounding 713 diamonds and finished off with Roman numeral hour markers in Everose gold. 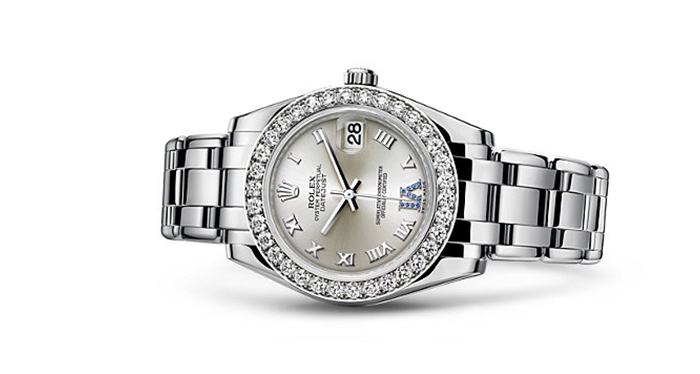 It is one of the best womens rolex watches with diamonds. This powerful white timepiece seems like it was made for the 21st century empowered woman who spends her time shattering glass ceilings. The multi-linked strap made out of white rolesor has been left quite simple to focus all the attention on the elaborate dial. 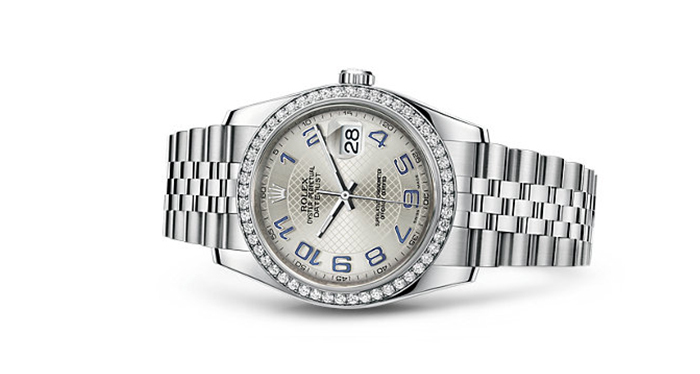 The silver dial has been bezel set with diamonds, embossed with an intricate mesh pattern, and set with contrasting blue numerical hour markers that have been given a gorgeous marble finish. 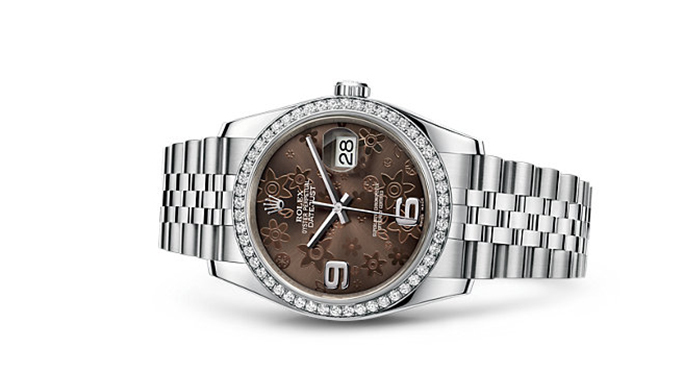 This Datejust 31 timepiece is quite a study in mixing and matching different textures. While the bracelet is crafted out of smooth yellow gold, the milky mother-of-pearl acts as quite a lustrous contrast. The whole piece has been given a generous helping of diamonds that coat the bezel and the lugs, and also act as sparkling hour markers. When you behold this all white gold timepiece, you best be sure that the ice queen cometh. Dripping with diamonds and crafted out of the purest 18 karat white gold, you best be sure that this is one watch that is bound to make heads turn. The stark whiteness of this extraordinary watch is accented by VI hour-mark that is encrusted with blue sapphires to create a striking contrast. 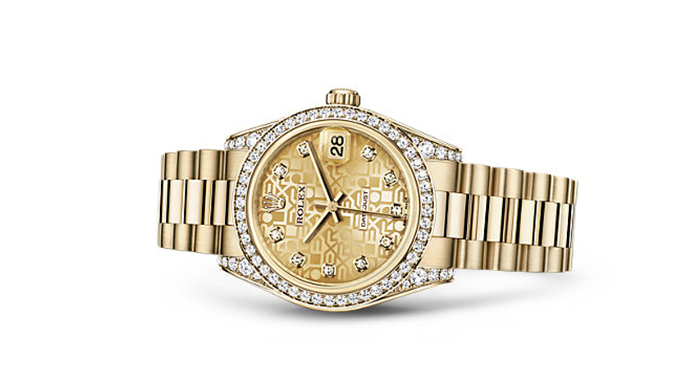 Bring a touch of old world charm into your lives with this gorgeous timepiece from the Lady-Datejust line of Rolex watches. 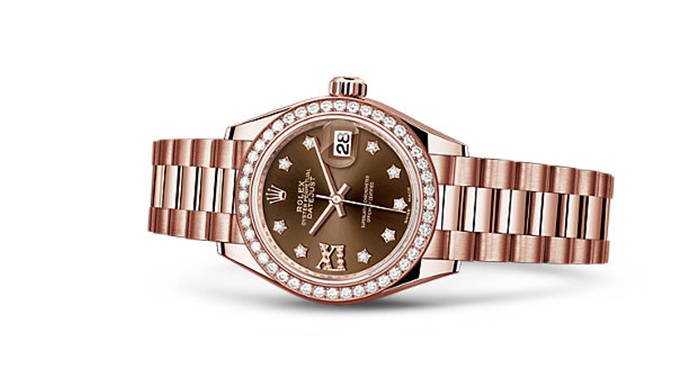 With the Everose gold strap and diamond encrusted bezel, Rolex has retained its classic and luxurious look. 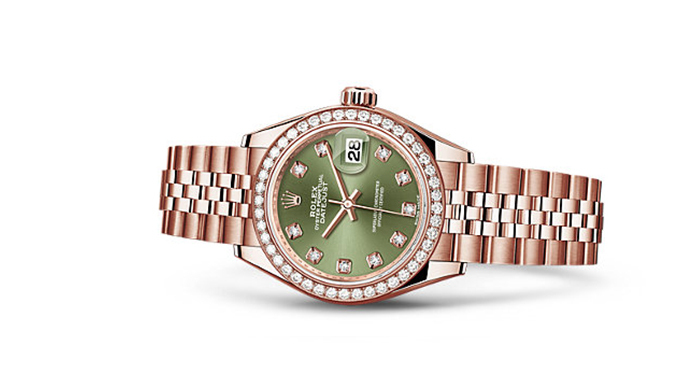 But what sets this piece apart is the military-inspired olive green dial that complements the rose gold hue of the metallic strap and the sparkling diamond hour markers beautifully. If your style leans more towards pastel shades and subdued designs, this Pearlmaster 29 design will suit your taste perfectly. The five piece-links of the Pearlmaster bracelet made out of solid white gold exude a certain sensuality while still retaining its simplicity. 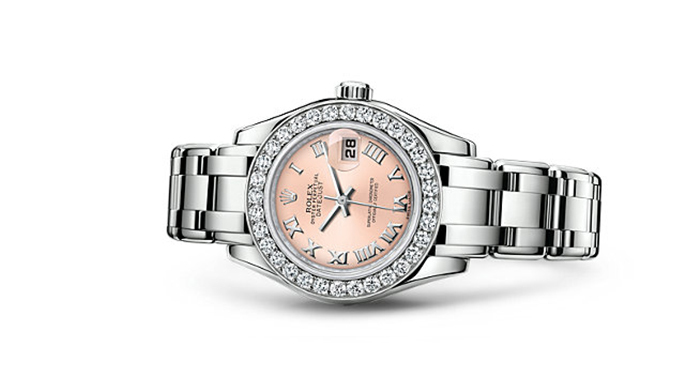 The classy Roman numeral hour-markers set on a pretty pastel pink dial are the epitome of regal elegance. 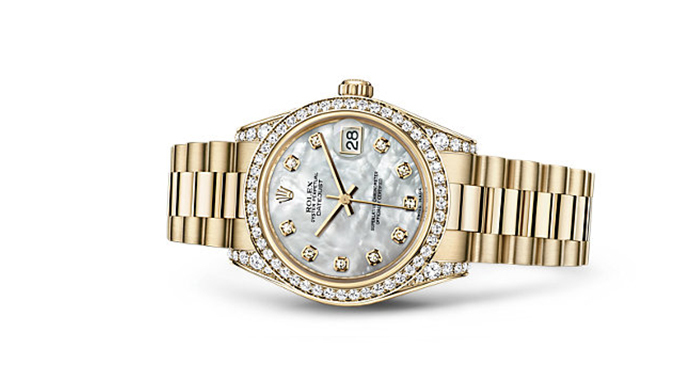 Well, those are our picks of the top 20 Rolex watches for women. Comment below to let us know which piece was your favorite and if we have missed out on any of your favorites!